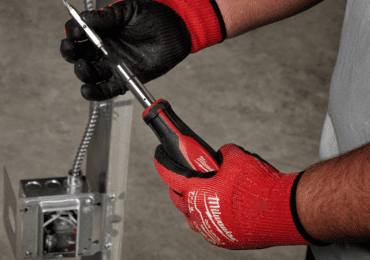 Milwaukee Tool recently announced its new line of 2nd generation screwdrivers. Redesigned and rebuilt for durability, these new screwdrivers aim to build upon Milwaukee’s reputation for heavy-duty craftsmanship. With the 10-piece kit MSRP at less than $30, the new Milwaukee screwdrivers 2nd Generation seem to be a great value. Milwaukee’s 2nd generation screwdrivers feature redesigned handles. An ergonomic, tri-lobe design adds comfort and allows for extra torque. Milwaukee has also printed driver sizes and shapes on the end of the handles, making them easier to identify in the toolbox or in the pouch. As well, they’ve punched holes through the end of the handle should someone want to string a lanyard through it. Also, improved upon in this new line of Milwaukee screwdrivers 2nd generation are the driver tips. Crafted from hardened magnets, these tips provide better bit retention and durability. The demolition drivers in this line feature an all-metal core that runs through the length of the handle. Fitted with chrome vanadium steel strike caps, these hammer-ready drivers defend against breakage (which is happy news for your hands). These updated Milwaukee screwdrivers will be available in a variety of sets and will be released in August of 2017. Everybody in the shop could use a good set of drivers. I really like that these screwdrivers have sizes clearly printed on the handle. These Milwaukee screwdrivers 2nd generation address my compulsive need to stay organized without my labeling them with a Sharpie. Plus, not having to dig around through a drawer to find the right driver saves me time and frustration. I also enjoy that these drivers are durable. Especially in the case of the demo drivers, a strike cap and through- handle design are great innovations. There is a peace of mind that comes from knowing that there won’t be a broken handle or fractured fingers in my future. I also appreciate a more durable, more magnetic tip; it means I lose fewer fasteners into the proverbial ether. If the age-old bit of wisdom that “time is money” is true, then functionality, durability, and visibility become helpful qualities when considering your hand tool purchases. These updated screwdrivers seem like they could save me some time. With that in mind, Milwaukee’s line of 2nd generation screwdrivers could be a worthwhile investment. For more information, check out the Milwaukee Tool website.